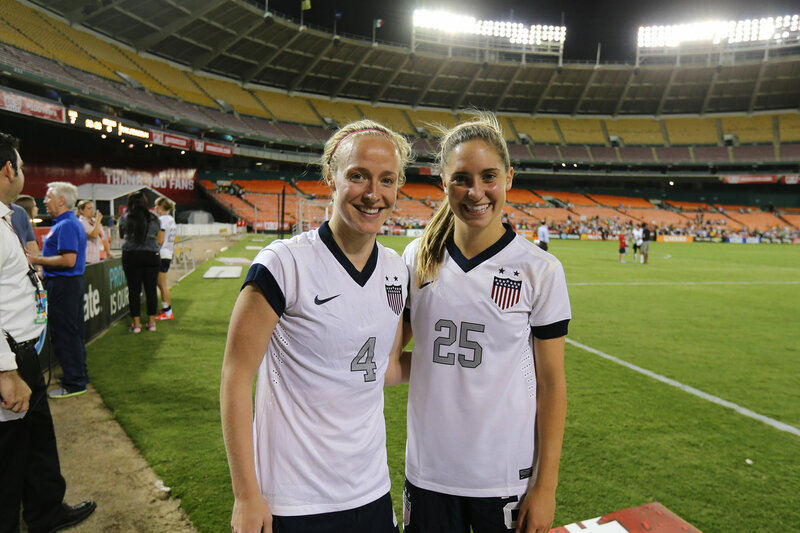 Soccer superstar Morgan Brian is walking the Lawn on Sunday, collecting a degree from the University of Virginia earned after winning the 2015 World Cup and traveling with the national women’s team to Brazil to compete in the Olympics in 2016. 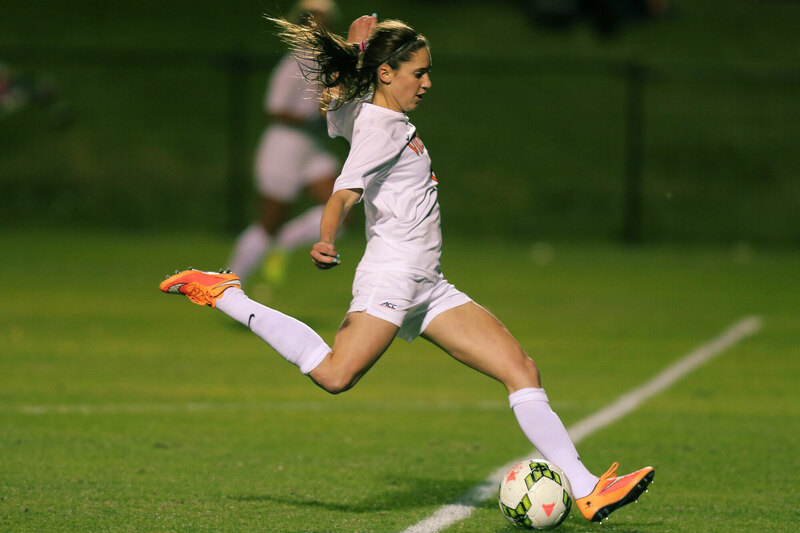 Brian came to the University in 2011, when she was 18, from Saint Simon’s Island, a small Georgia community where soccer is king. “I started playing when I was 4 and I’ve played ever since then,” she said. 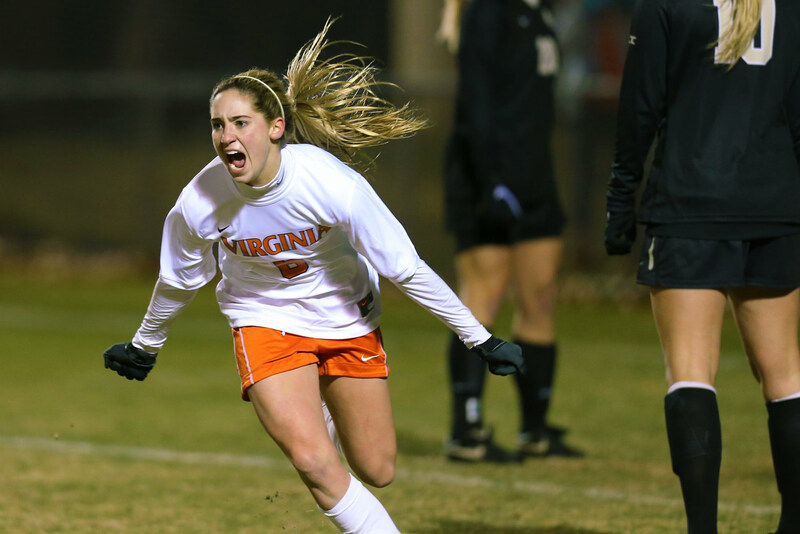 She earned a spot on the United States Women’s National Team in her third year at UVA, beginning the tough balancing act of playing professional soccer and earning a degree in kinesiology from the Curry School of Education. Speaking from Texas, where she now plays professionally for the Houston Dash of the National Women’s Soccer League, Brian told UVA Today about her time in Charlottesville and what it means to graduate six years after becoming a Wahoo. Q. Why did you choose UVA? A. I’ve always wanted a great mixture of academics. The Grounds are beautiful. The soccer is great and the people made the place even more special. The coaching staff is the best in the country. I’ve had a lot of coaches in my career. Coach Steve Swanson and his entire staff took my game to the next level. It really helped me to become a better player and better person. I think they have the best balance of being great human beings, but also they are in the top of their field in coaching soccer. Q. How was the transition from playing with the youth national team to Division 1 soccer in college? A. It was definitely different in the sense of playing at a high level every single day and trying to balance school at the same time. With the youth national team, we would go into a camp for a week and then we would go back home and be at school and playing on our club teams. In college, you are competing every single day, but you are also expected to compete at a high level in academics. It’s a step up in every sense. Q. What were your early days at UVA like? A. My first year was really tough, especially my first semester. I was really homesick. My parents actually came every weekend. When we had a home game, they would come. When we played in the ACC, against Duke and North Carolina, it was closer to home, so they could come to those games. My freshman year, the girls that I came in with, we all became best friends, which was a bright spot. Q. What was it like joining the team? A. I think our first year was a rebuilding year of team chemistry and trying to gel with the older players. It was one of those instances where we had a tough time integrating ourselves with the current team. Throughout our four years, we decided that we were going to change the environment in regard to the team chemistry and the way things were running. We developed this motto of ‘All in,’ where everyone is important, everyone got along, and the team was an extremely cohesive bunch. We accomplished the goal of changing the team culture on and off the field by the end of our time at UVA. Q. How did you help change the team’s chemistry? A. The first thing we decided to do as second-years was when the first-years came in, we wanted to make sure they were welcomed, felt comfortable and knew they were going to be extremely important to our team. We tried to eliminate the idea of cliques or classes only hanging out amongst themselves. It’s hard being a first-year. Some people are very far from home, young and have to dive into an extremely overwhelming, new environment. We have preseason even before school starts. We really tried to incorporate them into our team quickly to show them that we care about them and were there to help them in any way possible. As we became third-years, the second-years that we took under our wings paid it forward to the new first-years. It was a domino effect. My last two years at UVA were some of the best chemistry-wise teams I have ever been on. Our chemistry had a direct correlation to our success on the field. Q. What does good chemistry look like? A. When you watch teams celebrate, you can gather a lot of information. If each person on the team demonstrates good body language, shows raw emotion and everyone on the bench is just as excited as the 11 people playing on the field, there is a strong chance for great team chemistry. I remember beating Florida State in overtime my third year, how quickly we all came together and dogpiled. [The score was 1-0.] Coach Swanson would always use this as an example during my last two years at UVA: The celebration was exciting, each player was equally happy for the team and it didn't matter who scored as long as the team was winning. I think he uses that in some presentations about teams. Celebrations are a great picture of a cohesive group. Q. What was it like to do well in both the classroom and the field? A. To be honest, I found it to be really difficult. It’s been six years and I’m just now graduating. I played in the under-20 World Cup when I was in college. I’ve played in the FIFA World Cup. I’ve played in the Olympics and I’ve been in school throughout the whole process. For me, it’s been super-difficult and hard to balance. It’s hard to give 100 percent to everything, especially when you have a full-time job and are also trying to graduate from college. Also, not being present on campus surrounded by classmates trying to achieve the same goal is tough. I have been in an environment surrounded by professional athletes who have not been in school for many years. On the road, our coaches don’t take into account allotting time to study. I had to be extremely disciplined over the years in order to make this happen. Q. When did you turn pro? A. We lost the [NCAA] national championship game in December . And then that night Coach Swanson and I flew to Brazil for the national team. We played in a tournament there. Losing in the national championship college game, traveling to Brazil and having to take all of my finals in a different country while on a national team camp was a very hard time. I got drafted to the Houston Dash in January of 2015. We were in camp for the national team most of 2015 due to preparing for the FIFA World Cup and then participating in the Victory Tour following us winning the World Cup. I took the spring  semester off and resumed classes after the World Cup in Canada. Then we started training for the Olympics. I took classes here and there, trying to knock away the credits I still had to earn. Q. Do you have any special memories playing for the Cavaliers? A. The game that we played against Notre Dame in 2013 and we won in double overtime. We broke the attendance record that night. There were nearly 3,000 people in the stands. It was pouring rain the whole game. It was one of the most fun games I’ve ever played in. That was the year we had the best team chemistry and one of the best teams in college soccer ever, in my opinion. It was one of my favorite years in my soccer career so far and one that I will hold onto for the rest of my life. Q. How do you like playing with the pros? A. I love playing professionally. It’s definitely different when it becomes a job. A different element comes to the table when you’re getting paid to do something. There’s a lot more at stake, more pressure, and your body becomes even more important for your career. Playing for the women’s national team … it’s a very popular team and there is a lot of pressure to play at the highest level in front of so many people, which is a blast. Playing professionally allows me to be a role model for so many young fans and that is one of the best things about my job. I enjoy connecting with the fans and I love all of the opportunities I have gotten due to playing soccer as my job. Q. The national women’s soccer team recently signed a new labor agreement with the U.S. Soccer Federation. It provides a significant increase in compensation, per diem rates that are equal to those of the men’s national team and greater support for players who are pregnant or adopting a child, Can you talk about your role in that process? A. Three of my teammates and I were involved in a “60 Minutes” piece that revolved around our labor agreement and U.S. Soccer. Our entire team was relentless when it came to fighting for what we felt we deserved. It was an extremely long process that required a lot of attention and a lot of hard work behind the scenes. It was stressful at times, because we not only wanted to fight for ourselves as women, but also for all women across the workforce. It was very rewarding to see how many people we inspired by us fighting for fair treatment as women. There were multiple meetings where we were trying to figure out where we want the landscape of women’s soccer to be in 10 years and what we felt we deserved. Q. How does it feel to be graduating? A. It is a huge relief. I am happy to finally say I have graduated from the University of Virginia. It is a happy time for my family and myself. All of my hard work has finally paid off and now I can fully concentrate on soccer. I would not have been able to do this without my adviser [kinesiology professor and department chair] Art Weltman and the entire kinesiology faculty. They were extremely flexible and worked together to help me graduate while fulfilling my dream. So thank you to them and everyone who made my time at UVA wonderful! I had some of the best years of my life because of the coaching staff, my teammates and my friends. The Grounds, the school, all rolled into one really made for a one-of-a-kind experience. It has been the best four years of my life and I will always cherish it.